For the local government area, see City of Canterbury, New South Wales. For the State Electoral District, see Electoral district of Canterbury. Canterbury is a suburb extending across south-western Sydney and the Inner West, in the state of New South Wales, Australia. Canterbury is located 10.5 kilometres south-west of the Sydney central business district in the Canterbury-Bankstown Council. The former City of Canterbury takes its name from the suburb, however its administrative centre is located in the adjacent suburb of Campsie, which is also a large commercial centre. The original inhabitants of the area were the Bediagal clan of the Eora nation. In 1793, the area's first land grant was made to the Chaplain of the First Fleet, the Rev. Richard Johnson. He gave the 100 acre (40 hectare) grant, located one mile (1.6 km) north of the river, the name Canterbury Vale. The grant was passed onto William Cox, who sold the land for 525 pounds to Robert Campbell in May 1803, after going bankrupt. By 1834 the Campbell Estate grew to 1,242 acres (5 km²). In 1865, daughter Sarah Jeffrey subdivided the land into allotments, each containing several acres. The first major industry was established in 1841 with the building of the Australian Sugar Company's sugar mill by the Cooks River to produce molasses and spirits. Other industries and trades such as boiling down works and tanneries later developed along the river. The Methodists built the first church in the suburb, with services beginning in 1841. The railway line was completed in 1895, encouraging suburban development and leading to the area becoming heavily populated. This was too late for the Sugar Mill, which ceased production in September 1854, but was favourable for horse racing, which informally began in 1871. After much petitioning of the State Government by local residents, the Municipality of Canterbury was proclaimed on 17 March 1879. A Town Hall was opened in 1889, but eventually Campsie became a more important centre and the city administration was moved from Canterbury in 1962. In 1921, a tram line was extended from Hurlstone Park to Canterbury Station, in 1927, a through service from Canterbury to the city commenced. The Canterbury line commenced at the Canterbury terminus in Broughton Street where a tram turning loop was provided. Trams travelling towards the City or Balmain headed north-east along Canterbury Road. A service that was provided for by the Darling Street Wharf trams branched off from the main line at New Canterbury Road and connected with lines running along Parramatta Road for Balmain. Services heading towards Marrickville, Newtown, Sydenham and Tempe turned right into Marrickville Road. The line from Dulwich Hill to Canterbury branched off from the Tempe line at Newtown, travelled along Enmore Road, then Victoria Road, before tuning right onto Marrickville Road and all the way through to Canterbury Road to the Canterbury terminus. Another line also branched off from the route to Dulwich Hill at Addison Road on Enmore Road, then travelled along Addison Road to New Canterbury Road in Petersham. The line then travelled down New Canterbury Road through Dulwich Hill and Hurlstone Park to Canterbury railway station. A short lived single track line operated from the Canterbury Line at Hurlstone Park along Old Canterbury Road and Prospect Road to Summer Hill railway station. Services operated between Canterbury and Summer Hill from 1915, however low patronage and competition from motor buses saw the line close in 1933. The disused track and overhead remained in place until the 1950s. Buses replaced the trams in 1954. The Canterbury terminus is currently used as a layover area for buses. According to the 2016 census of Population, there were 7,233 residents in Canterbury. Australian born residents are a minority with 43.6% of people being born in Australia. The most common countries of foreign birth were China 9.3%, Vietnam 3.8%, Greece 3.5%, Nepal 2.9% and Philippines 2.3%. In Canterbury 36.6% of people only spoke English at home. Other languages spoken at home included Mandarin 9.2%, Greek 8.2%, Vietnamese 4.7%, Arabic 4.7% and Cantonese 3.9%. The most common responses for religion were No Religion 27.0%, Catholic 24.6% and Eastern Orthodox 11.1%. The most common ancestries in Canterbury were Chinese 13.3%, English 10.6%, Australian 10.5%, Greek 7.7% and Irish 4.7%. Canterbury has a humid subtropical climate (Cfa). High density mixed use buildings are located along Charles Street, Broughton Street, Canterbury Road and Close Street. Commercial developments are mostly situated on Canterbury Road and surrounding streets. Commercial offices will be built along Canterbury Road, Broughton Street, Charles Street and Close Street as part of the Canterbury Centre Masterplan. The current shopping precinct, close to Canterbury railway station, includes an Aldi supermarket and the landmark Hotel Canterbury. Lumex Canterbury is a shopping plaza along Canterbury Road and Cooks Avenue which includes dining shops and a fitness centre. On 16 November 2016 a Woolworths shopping centre opened on the corner of Canterbury Road and Charles Street. Canterbury Road is a major arterial route, 11 kilometres long and the only vehicular crossing of the Cooks River within the suburb. The road connects the inner suburbs of Sydney with Bankstown and suburbs further to the south-west. Secondary routes, King and Holden Streets, connect the suburb to Ashfield in the north. Canterbury railway station is located on the Bankstown line of the Sydney Trains network. The line, which crosses the Cooks River, was opened in 1895 and electrified in 1926. Two additional tracks were laid for goods traffic through to Port Botany. The station is the terminus for several Sydney bus routes. Extensive parkland may be found on the banks of the Cooks River. Canterbury Park Racecourse, a 33 ha. racecourse on the northern bank, features a 1,578-metre track (racecourse) and attracts thousands to its horse racing carnivals. Tasker Park is on the southern bank of the Cooks River near the railway bridge. It is named after WS Tasker (Alderman 1925-31 and 1937–44). It includes playing fields, a swimming pool and an ice rink. It is connected to the northern bank by a footbridge. Mary MacKillop Reserve is on the southern bank of the Cooks River next to the Canterbury Road Bridge. Originally a rubbish tip, it was built up above flood levels from riverside soils in the 1930s. The reserve was named after Alderman Sydney Hollingsworth Simpson, who helped secure the land, however many residents assumed it was named after Wallis Simpson. A path along the river called "Coronation Row", commemorates the coronation of Queen Elizabeth II and her visit to Sydney in 1953. Simpson Reserve was renamed Mary MacKillop Reserve by Canterbury City Council in 1995. Canterbury Park, according to modern boundaries, is part of Ashbury. It is home to Campbell and Blick Ovals. St Paul's Anglican Church is located on 33 Church St. It was built on part of Robert Campbell's Canterbury estate on land donated by his daughter, Sophia Ives Campbell. The Church was designed by Edmund Blacket. It was built from local sandstone and was completed between 1858 and 1859. The church was consecrated on 12 April 1860. It is built in the Gothic Revival Church style with a steeply pitched roof which was originally covered with slate, but now by cement tiles. It features stained glass windows and a lych gate on heavy stone piers. Uniting Church Fiji Parish is a Fijian Uniting Church located on 301 Canterbury Rd. A Methodist church previously occupied the site. 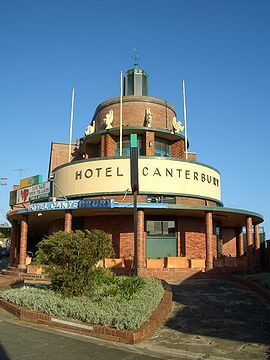 Canterbury is located in the Canterbury Ward of Canterbury-Bankstown Council. For New South Wales state elections, the suburb is in the Electoral district of Canterbury. For federal elections, Canterbury is primarily located within the Division of Watson. In state and federal elections, Canterbury residents predominantly vote for the Australian Labor Party. Vali Myers, Artist, born in Canterbury. ^ a b c Australian Bureau of Statistics (27 June 2017). "Canterbury (State Suburb)". 2016 Census QuickStats. Retrieved 12 July 2017. ^ "Map of Traditional Boundaries & Aboriginal Languages". City of Canterbury Bankstown. City of Canterbury Bankstown. Retrieved 13 December 2016. ^ Muir, Lesley. "Aboriginal people of the Cooks River valley". Dictionary of Sydney. dictionaryofsydney.org. ^ "Canterbury Railway Station group". New South Wales State Heritage Register. Office of Environment and Heritage. H01109. Retrieved 18 May 2018. ^ "Bethungra". New South Wales State Heritage Register. Office of Environment and Heritage. H00224. Retrieved 18 May 2018. ^ "Old Sugarmill". New South Wales State Heritage Register. Office of Environment and Heritage. H00290. Retrieved 18 May 2018. ^ "Woolworths opens Canterbury store". RetailWorld. Retail World Magazine. Retrieved 30 December 2016. 1.^ Canterbury extends across both sides of the Cooks River, which forms a natural defining boundary around the outer limits of the Inner Western suburbs of Sydney.